It seems that we have at least a three-episode arc of family visits in the back half of season fifteen of Grey’s Anatomy. In the last episode, we learned the devastating truth of Jo’s origins when she met her birth mother for the first time. This week, the Hunt family is examined, and it seems a similar situation will play out in the next episode which will feature a Shepherd family reunion. Plenty of characters have been struggling lately and are unwilling to open their eyes without someone blatantly calling them out. This episode actually doubles as a great catch-up because all of the big storylines are exposed and cross-examined. After last week’s depressing dual plotlines, this was the perfect time for Megan Hunt to show up and lighten the mood of the show. While she is only checking in for one episode, it is always a pleasure to see her feisty spirit come alive and take action. Meredith and Jackson have assembled a team to operate on one of Megan’s patients: a military veteran who suffered several devastating injuries while in battle and needs abdominal wall, penal, and scrotal transplants. 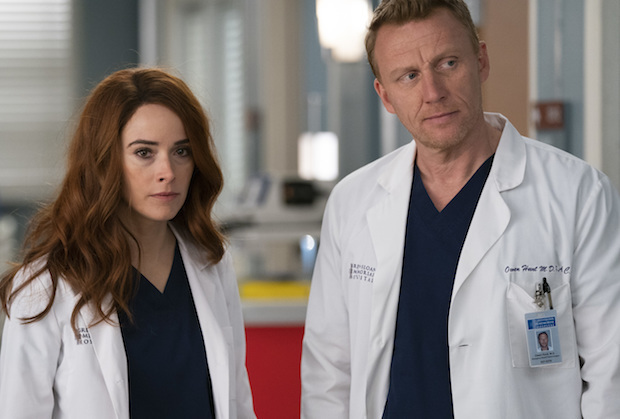 The writers couldn’t have come up with a better case to get Abigail Spencer to reprise her recurring role and talk some sense into her character’s very stubborn brother. Meredith greets Megan when she arrives and accidentally spills the beans about Owen and Teddy’s baby in the process. Owen didn’t know that Megan was coming to visit and had yet to mention anything about his unborn baby, most likely because he didn’t want the ensuing attack from his sister. Let’s just say that Megan is very disappointed to hear that Teddy and Owen are not a couple and gives both of them several earfuls of her opinions. Megan knows that Teddy and Owen have loved each other for long enough that a baby in the mix should have catapulted them into a real relationship. She is beyond angry at Owen for his treatment toward Teddy (i.e. how he went to Germany for a one night stand and didn’t try to win her over), and can’t believe that he gave her his job instead of a marriage proposal. Megan’s antics are quite entertaining, and she is incredibly spot-on with everything she says. Teddy and Owen have a complicated history which they have been trying to avoid like the plague for too long. Since trying to convince both together and separately that they belong together didn’t work, Megan decides to take a more drastic step at the end of the episode. She catches Owen off-guard with a very accurate mental health profile of him and how he is unwell. Citing the Germany incident, being with his ex-wife, and fostering Leo and Betty as examples, Megan paints a picture of Owen being mentally unstable and in dire need of help. This is something that I haven’t thought of and wasn’t necessarily apparent until Megan says it. Now that she mentions it, it does make a lot of sense. Meredith and Jackson recruit Megan, Owen, Catherine, and Schmidt to help out with their extremely difficult surgery. When they present Catherine with the idea of the surgery, she is overjoyed that her son has given her the best gift ever. The light and fluffy demeanor of the episode is quite charming in this moment and provides a good laugh. The surgery is quickly in jeopardy when the team finds out that the patient lied about having a support system in place. Catherine refuses to operate if the patient isn’t going to have the help he needs post-op. Jackson confronts her about her decision to see whether she is more afraid for the patient or of her first time back in the OR since her own surgery. Owen has a heart-to-heart with the patient and learns that he is really insecure about not currently having his manhood. This is exactly what Owen thought the problem was, so he gives a speech about how letting people in is the best way to deal with the problem. The patient had broken up with his girlfriend after the accident and doesn’t want to let her back into his life. Owen convinces him to give her another chance, and it all magically works out. Since the patient has a support system, Catherine agrees to do the surgery, which goes perfectly. This episode also marks the end of Alex’s reign as chief of surgery, as Bailey officially takes back her full duties. Alex takes on a new patient, while Bailey is left trying to figure out where all of the business reports are and how to teach some high school students about leadership, which was an unfortunately-timed prior commitment. Helm helps Alex treat a young autistic boy suffering from chest pain and fatigue. The boy doesn’t like to be touched and has trouble communicating, so they have to get creative to do an exam. The parents tell Alex that their son loves architecture, so Alex strikes up a conversation with the kid about a building. Alex uses architecture metaphors to get the boy to tell him exactly what is wrong. They find that he has a tumor on his thymus gland, but they can’t surgically remove it right away because the patient is anemic. Alex brings Maggie on the case, and they give him a blood transfusion to treat the anemia, but the boy’s body rejects the blood. After several blood tests, the doctors find out that the kid has the rarest blood type in the world: AB with no Rh factor. Since the child’s blood isn’t AB+ or AB-, they need to find blood that is an exact match. However, only a few people in the world have this rare blood type, so finding a donor will not be an easy task. Maggie is surprised to hear Alex tell the patient’s parents that he will do whatever it takes to find a donor and treat their son. Meanwhile, Jo has spent the past week curled up in bed and not talking to anyone. Alex sends Link to the rescue to see if he can get Jo to talk about what happened with her birth mother. Jo isn’t thrilled to see Link, who tries to take care of her even as she constantly rejects his help. He gets Jo laughing and having a decent time after she downs almost an entire bottle of vodka. She begins to tell him about how whenever a situation gets tough she runs away. She says that it’s in her blood to handle problems by running away and states that her mom still does the same thing. Jo almost tells Link the truth, but quickly shuts down and finds more alcohol to drink. When Alex gets home, Link tells him that he has seen Jo go through some rough times, but nothing like this. Both men are very concerned for Jo and are both silently hoping that she doesn’t revert back to her old pattern of disappearing when things get tough. The last important story of the episode sees Richard giving DeLuca a solo surgery. DeLuca is worried that it is a test of both his surgical skills and his commitment to Meredith, as he will be trapped in an OR under the watchful eye of Richard. Meredith is also nervous that the surgery will take a hard turn and DeLuca won’t be able to prove himself. It’s odd that Meredith has next to no confidence in her boyfriend, which is a telling sign that their relationship probably won’t work out. DeLuca decides that Richard is going to be more of a father figure rather than a teacher and wants to impress Meredith’s pseudo dad. Since this is the comedic episode, DeLuca is very wrong in his assumption and continuously says and does the wrong things. It’s fun to watch DeLuca trip over his words and try to find hidden meanings in everything Richard says, especially when he keeps saying way too much about caring for Meredith. However, when he discovers dead bowel in the patient, DeLuca stay calm, cool, and collected and easily converts his laparoscopic surgery to an open procedure. Richard wants to take over at this point, but DeLuca tells him that he can do it and wants to see it through. DeLuca shows Richard that he knows exactly what he is doing and wants to become a general surgeon. Richard is impressed and even puts in a good word to Meredith about DeLuca’s surgical and personal skills.